Debt collection laws regulate collection agencies and attorneys. The Federal Trade Commission enforces the Fair Debt Collection Practices Act (FDCPA), which prohibits debt collectors from using abusive, unfair, or deceptive practices. 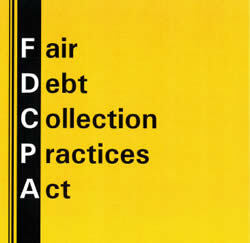 This FDCPA is the most important of the Federal debt collection laws. Under the FDCPA, a debt collector is someone who regularly collects debts owed to others. This includes collection agencies, lawyers who collect debts on a regular basis, and companies that buy delinquent debts and then try to collect them. While the FDCPA generally applies only to third party debt collectors – not internal collectors for an “original creditor”; some states have similar state consumer protection laws which mirror the FDCPA, and regulate original creditors. In addition, some federal courts have ruled that a collector of debt is not a “creditor” but is rather a “debt collector” under debt collection laws where the collector of debt buys defaulted debt from an original creditor for the purpose of debt collection. Debt collectors may not harass, oppress, or abuse you or any third parties they contact. Debt collectors may not lie when they are trying to collect a debt. Debt collectors may not engage in unfair practices when they try to collect a debt. Knowing and abiding to the proper State debt collection laws is important for both creditors and collection agencies alike. State collections laws vary widely, and knowing the proper collection law for your debtor’s state is essential. The FDCPA has often been used to file frivolous lawsuits and seek damages for minor technical violations and has, at times, seriously hindered the ability to collect valid debts. Given the strict liability nature of the FDCPA, the collections industry and the insurance companies who provide liability coverage for them have repeatedly lobbied Congress to relax provisions of the law to reduce their civil exposure for these “hyper-technical” violations. Disclaimer: Please note this website site not intended to give legal advice. Debt collection laws change and are amended as time passes, so please consult with your attorney and/or State’s current laws before you use this information.